So, no awkward & awesome Thursday post today. Actually was thinking about A&A yesterday on my way home since I thought all day yesterday it was Thursday! Seriously. I was even on my way to Wednesday night pitching lessons when I realized that it was in fact Wednesday and not Thursday. All because I had turned my planner over to the Thurs-Sun page for this week. I thought I'd participate in Throwback Thursday though. 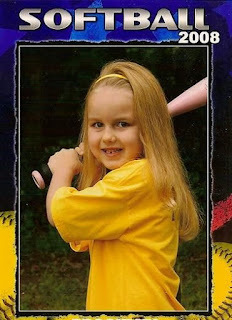 This is from B's very first year of softball. The first time she swung a bat. I can't believe that has been 4 years ago. She looks so mini here. And man did that kid's hair have volume! You know the drill...A&A Thursday!